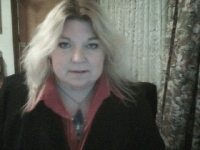 Hi, My name is Dawn, I live in Hertfordshire, I am divorced & live with my two daughters, aged 15 & 13. I am an Accounts Administrator. I am also a medium in training, & into spiritual stuff. Good sense of humour & love karaoke & having fun. Been alone for far too long, time to change that. I have soooo much to give, you would be pleasantly surprised!! Just ask me!! I am looking for fun with guys or girls. E.mail me & see where we go.